Stockholm, Sweden. October 24, 2018 – In an inauguration ceremony presided over by the King and Queen of Sweden, the country’s Nationalmuseum reopened after a five-year $132 million renovation. ArtRatio (www.artratio.co.uk), in collaboration with VariGuard SmartGlass (a business unit of Research Frontiers Inc.: Nasdaq: REFR), was selected as part of this initiative to protect priceless books and objects from damage as a result of exposure to light. Top: ArtRatio display case, with VariGuard SmartGlass, in the >99% light-blocking and clear states. Bottom: Light-sensitive items being displayed in the case – SmartGlass in the clear state. To experience ArtRatio’s SPD-SmartGlass display case in operation at the Nationalmuseum of Sweden, please see this video. Also, this video shows the motion-activated switching of the SmartGlass. The Nationalmuseum selected ArtRatio’s display case, engineered using VariGuard SmartGlass, to allow visitors to experience these objects while at the same time providing unprecedented protection against irreversible damage from exposure to light. Book of Hours, St. Christopher carrying the Christ Child, watercolour and gold on parchment, Spain, c1400. Book of Hours, Arrest of Christ, watercolour and gold on parchment, France, c1500. Ivory object, Christ on the Cross, France, c1350. Book of Hours, St. Catherine and Kneeling Donor, watercolour and gold on parchment, Netherlands, c1430. Book, The Hours of Giraldi-Guicciardini: The Rising of Lazarus; Death Carrying a Scythe; 1500-1525, Watercolour, gold on parchment, Italy. Many objects in the collection date from the Middle Ages and are highly susceptible to permanent damage from exposure to UV, visible and infrared light. 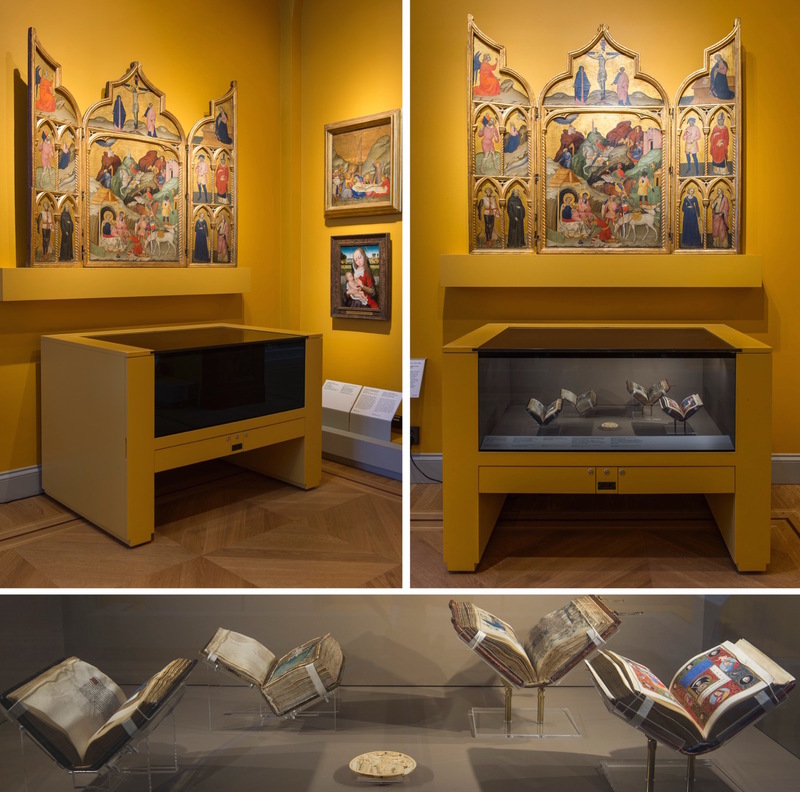 To exhibit the selected items, the Nationalmuseum collaborated with ArtRatio to design a display case which uses VariGuard’s SmartGlass instead of traditional conservation glass. The exhibition of these highly-sensitive works would not have been possible, or the exhibition duration would have been severely limited, were they not protected by ArtRatio’s display case using VariGuard SmartGlass. Traditional conservation glass protects against UV, but not against damage due to visible or infrared light. This does not provide optimal protection since UV accounts for less than half of the fading (often only one tenth). VariGuard’s SmartGlass not only protects against UV, it also protects against damage from visible and infrared light by silently, instantly and automatically switching from clear to over 99% light-blocking (whenever the books and objects are not being viewed) to provide maximum protection against fading and structural breakdown. The Nationalmuseum in Stockholm is Sweden’s largest museum of art and design, and its collections comprise more than 700,000 objects, paintings, sculpture, and drawings. Following the renovation, the museum offers larger display spaces across three floors that will showcase 5,200 objects (compared with about 1,700 before the renovation). ArtRatio is a private limited-liability company based in Elche, Spain, with offices also in London and Hong Kong. ArtRatio is dedicated to balancing the display and conservation of art, antiquities and luxury collections. Our name stems from the Golden Ratio, used by artists, architects and scientists, from Euclid to Da Vinci to Dalí, to emulate the divine proportions found in nature. To date, ArtRatio has protected two original maps of the 1815 Battle of Waterloo, an original Torres Spanish guitar from 1888 and rare manuscripts for private collectors and museums across Europe. For more information, please visit our website at www.artratio.co.uk, and on Linkedin, Twitter and Facebook. VariGuard SmartGlass offers the only glazing products with a wide range of visible light transmission, instant switching between dark and clear states, and over 99% UV-blocking at all times. Based on patented SPD light-control technology developed by Research Frontiers, VariGuard panels optimally protect items by limiting their light-exposure to those times people are viewing them. More information about VariGuard products is available on our website at www.VariGuard.com.